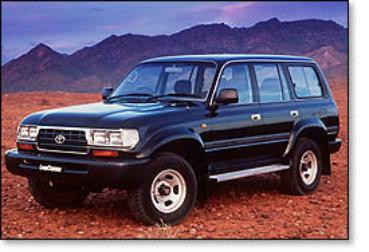 Toyota's 80-Series LandCruiser which landed here in 1990 really couldn't have arrived soon enough. all sorts of grief in the marketplace. (actually, it was a bit better) as the Toyota and a heck of a lot easier to live with around town. All of which made the LandCruiser look pretty silly. the psyche of even the most hardened 'Cruiser buyers. Then along came the 80-Series. the base model, and a centre diff-equipped full-time system for the other models. there's no centre differential) made sense in the context of the base model which still got rubber floor mats. of a sudden, LandCruiser devotees were happy again. At least they were if they could live with a diesel engine. on it - a nail. 1HDT was a turbocharger fitted to the latter. about 12 months after the initial launch. unstoppable since it delivered its power where it was needed and made sure there was always lots of it. groceries home from the shop. $35,000 for a 1990 model in good condition.